The Trackless Keyboard Tray has the ability to tilt up to 10 degrees down or up to 15 degrees up. Tilt it up to reduce strain on your wrists for a pain-free and healthier typing experience. The Trackless Keyboard Tray is easy to install, and easy to stow under your desk when not in use. Compared with traditional "sliding track" keyboard trays, the direct mounting of this tray leads to less shaking while typing. 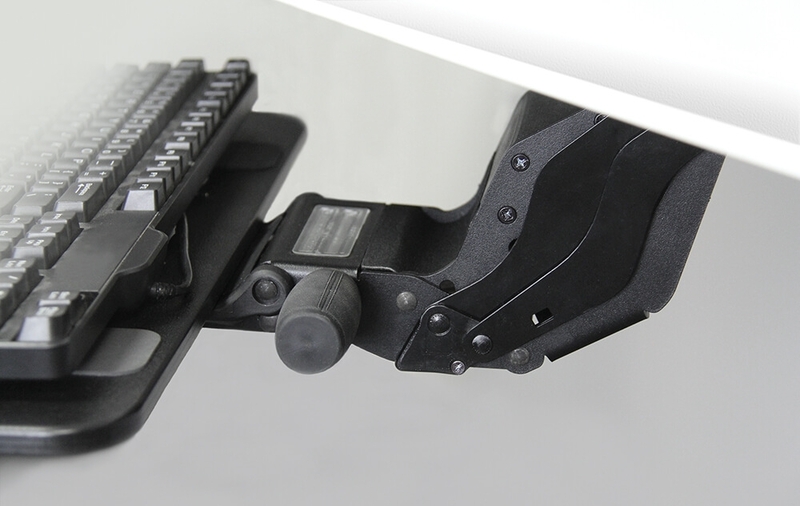 The mouse platform is independently adjustable, with a variable height, tilt, and position—move it closer to your keyboard so you don’t have to reach far. A handy tracking display means that you can easily return to your preferred positions. You may want to adjust your tray while sitting, standing, or walking, and the gauge makes doing so quick and easy. High manufacturing standards combined with a trackless installation give this keyboard tray unparalleled stability, so you can type with less shaking than ever. 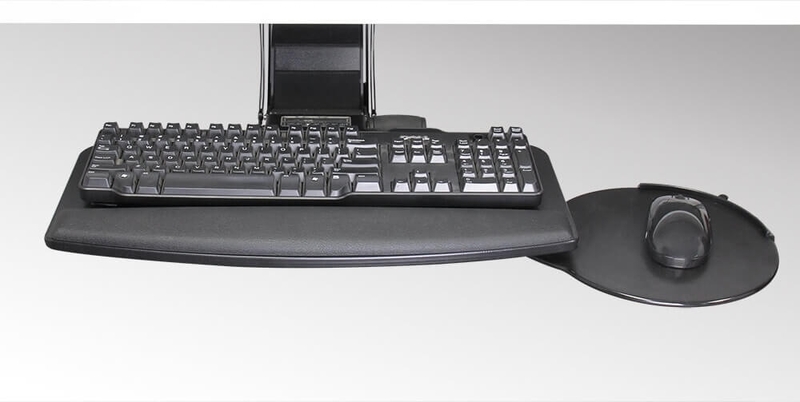 Those interested in the steadiest keyboard trays available should check out our SteadyType desks. Simply lift the front of the tray and push it under your desk for storage. 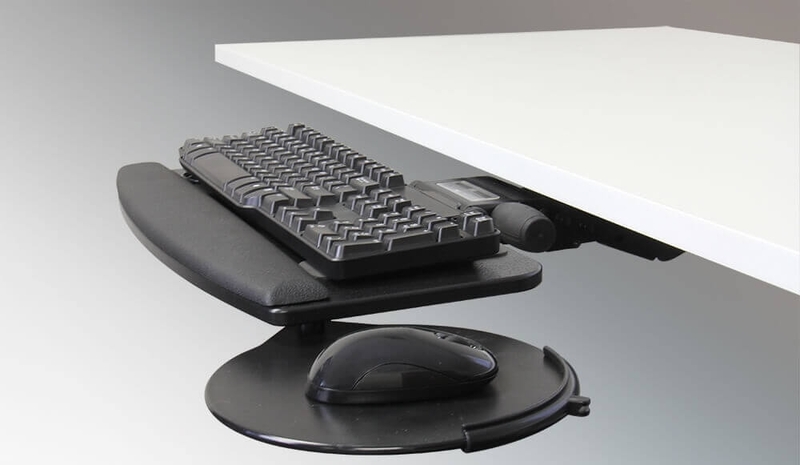 The entire tray also rotates around the mounting point, allowing you to swing it under your desk sideways if you prefer. Total height adjustment of 5.73"(-1.25" to -6.98" under desk). Dimensions: Tray: 19.4” x 9.4”. Mouse platform: 9.04” diameter. Mounting bracket: 4.2" x 6.25". *Please use the mounting template that came with your Trackless Keyboard Tray. If you print out a new copy of the mounting template, the pilot hole markers may not be drawn to scale. 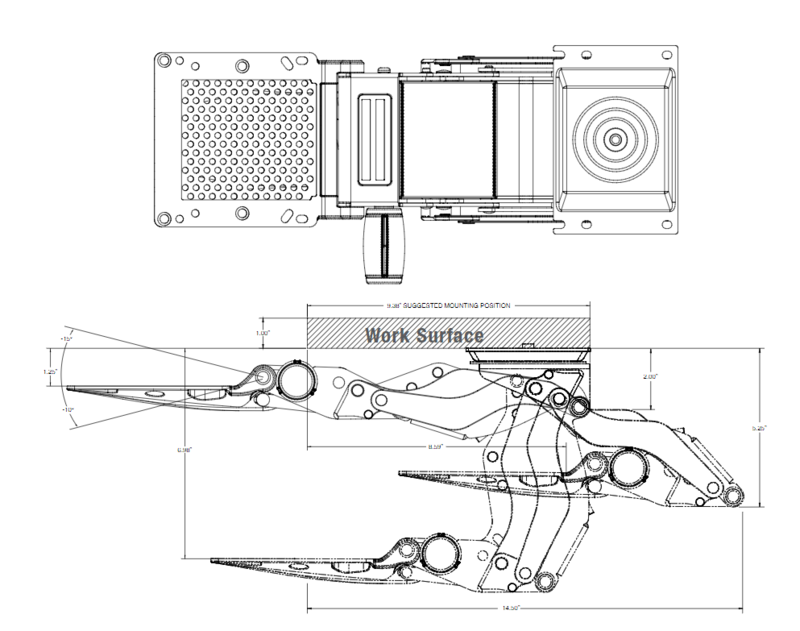 iMovR Lander Desks ship pre-drilled for the Trackless Keyboard Tray, so you can skip any step relating to drilling pilot holes! The Trackless Keyboard Tray comes with an impressive 15-year limited warranty.